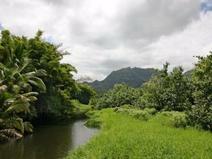 Hanalei, Haena & the area of Waniha are located on the far north side of Kauai island. Hanalei is known for it’s magnificent bay, Hanalei Bay. Hanalei Bay and beach are calm in the summer and home to some of the best surf in the winter. The town of Hanalei is buzzing with surf shops, eateries, locals & tourists. Movie stars are often spotted in town and on the beach as a number of them own homes in Hanalei. Just north of Hanalei is Haena. Access to Haena is by a rural road and one-lane bridges. Haena & Waniha are rural & tropical. There is great snorkeling at the end of the road of Haena. Hiking access for the NaPali trail is located here in Haena. Hanalei and the entire north shore of Kauai are tropical, picturesque and adventuress. Surfing, snorkeling, swimming, stand up paddling, canoeing, and hiking are just some of the everyday activities found in Hanalei. Hanalei Elementary School is located here. Homes in Hanalei come at a premium price. Hanalei beachfront homes are usually priced in the multi-million dollar range while non-oceanfront homes in Haena & Waniha can be found for under a million.